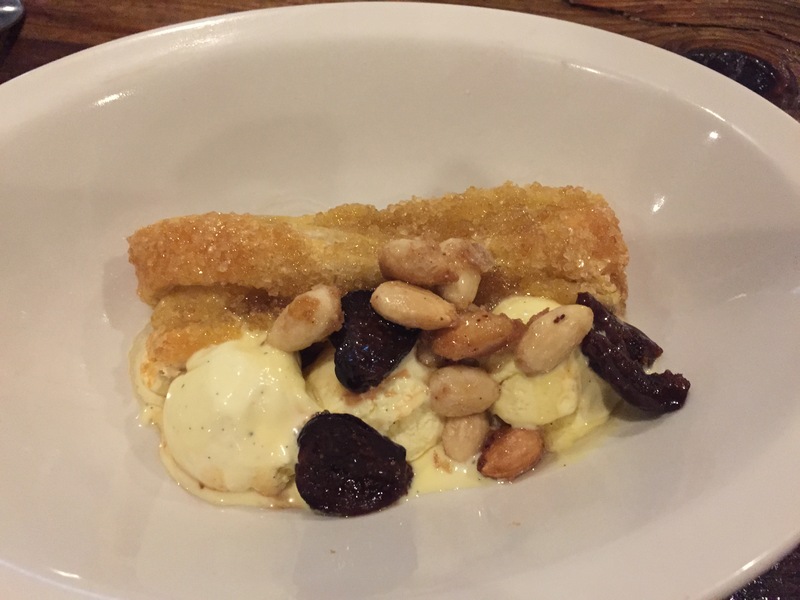 Hit It & Quit It: Mulefoot Gastropub – Eat. Rest. Repeat. Ask me how I liked this place, and that’s the reaction you’ll receive. My reasoning is simple: the food wasn’t anything special. At all. A lot of people have asked me about this restaurant because it has received a LOT of hype since its opening. I finally, after finding a Groupon, decided to make the 50 minute drive up to Imlay City to visit this highly-rated farm-to-table gastropub. Let’s be honest for a second about this farm-to-table fad….just because something is fresh, doesn’t mean it necessarily tastes good. And yes, the cuisine here is quite innovative, but it was certainly not enough to wow my husband and I. Will we be going back? Well, our Groupon included a $20 gift card for a future visit…so, maybe. Again, it wasn’t special. That does NOT mean that it was bad. The food was good, it was tasty, it was different…but it didn’t leave me yearning to go back. For me, I went, I ate, I conquered. Onto the next, hence why it falls into my “hit it and quit it” category. If you’re curious to try it for yourself, by all means, it is a great place! You’ll get great food and great service. But if you want a recommendation from me of some top restaurants in the area, this wouldn’t make my top 10. The Groupon I purchased for $79 included $60 bottle of wine, 2 entrees I believe up to $28 each, and a $20 gift card. Pretty good value. 2 Entrees is obviously not enough for a glutton like myself, so we ordered 2 appetizers and 2 desserts as well. 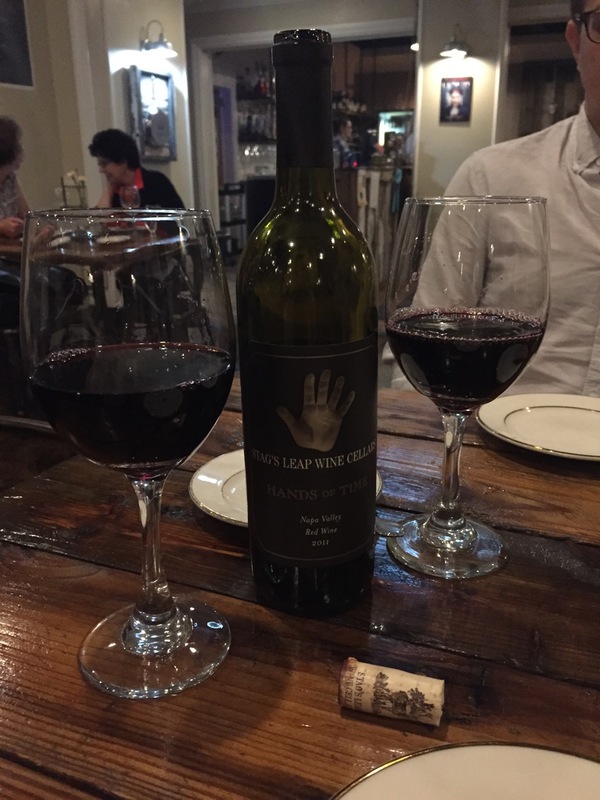 The wine we landed on is a Merlot Cabernet blend from Stag’s Leap. Mildly sweet but dry. I prefer Merlot while my husband prefers Cab, so this was a good compromise. Not your typical corn dog. Inside was a spiced sausage…reminded me a little of a breakfast sausage. The sauce on the plate was pretty good, and it harmonized well with the bready exterior and the tender meat. Great dish. 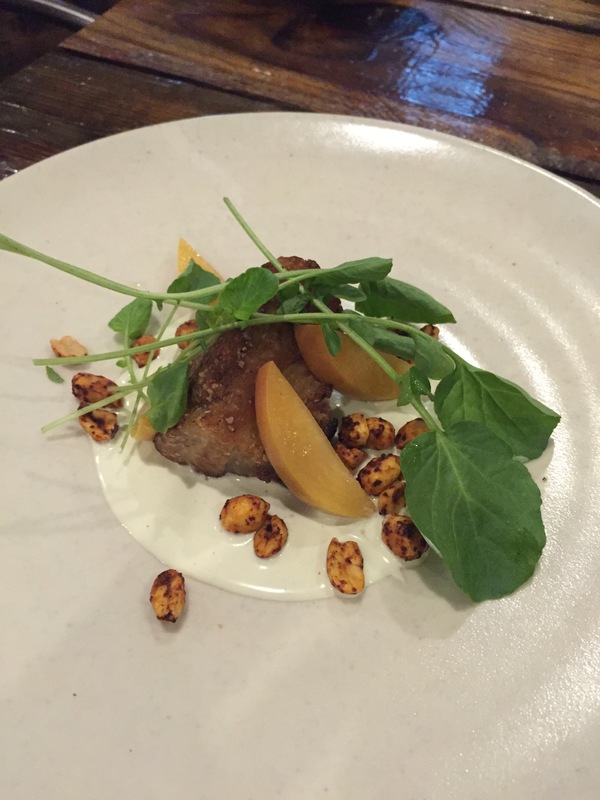 Second appetizer: Pork belly with pickled peaches, spicy peanuts, and cardamom cream. The pork was nice and juicy, with a salty crunch. I wasn’t a fan of the cream, as I don’t particularly like the taste of cardamom, but my husband loved it! The peanuts didn’t really go with this, but I can respect wanting to throw a little bit of spice in there. This isn’t my favorite way to have pork belly, but it wasn’t bad. My entree: Hay smoked Pheasant with gnocchi and pesto. 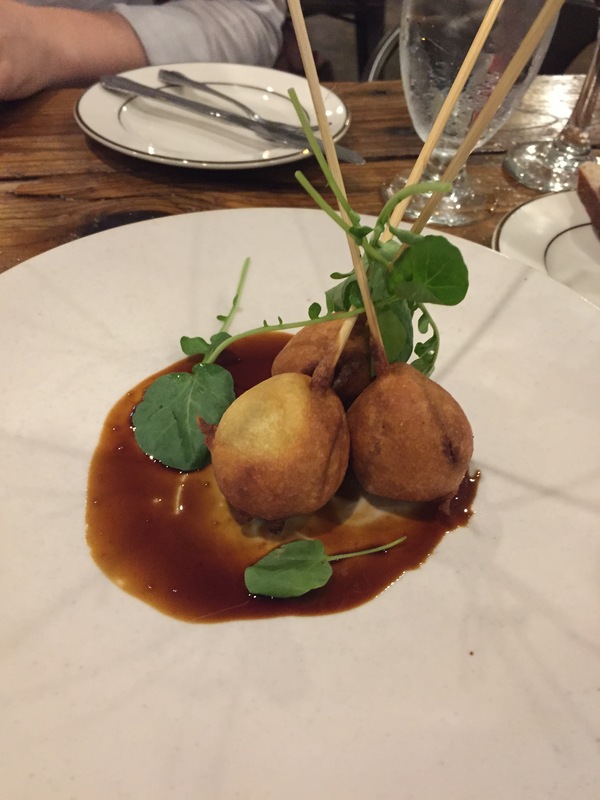 This entree really disappointed me; I was super excited when the waitress told me how the pheasant was cooked: hay smoked, then sous vide, then deep fried. I was expecting something rich in flavor, crunchy on the outside, and super juicy on the inside. Meh. 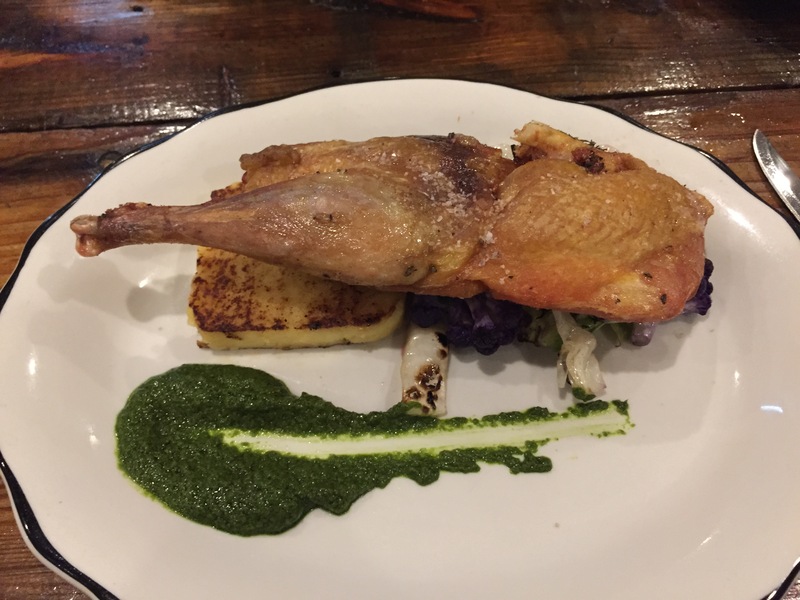 The dish came with half a pheasant, from breast to leg. The breast wasn’t very moist. The smokey flavor that I had been anticipating just wasn’t there. I would have been happier having $5 roasted chicken from Kroger. The gnocchi was a joke; it was in the form of a patty; it may as well have been a flavorless polenta. In fact, polenta would have been a better accompaniment. The pesto tasted nothing like pesto, but more like a chimichurri. Again, not bad, but nothing on the plate was relevant. The veggies provided, shown under my pheasant, were simply stir fried cabbage and purple cauliflower. It was ok, but not a wow factor. Nothing on this plate screamed “eat me”. 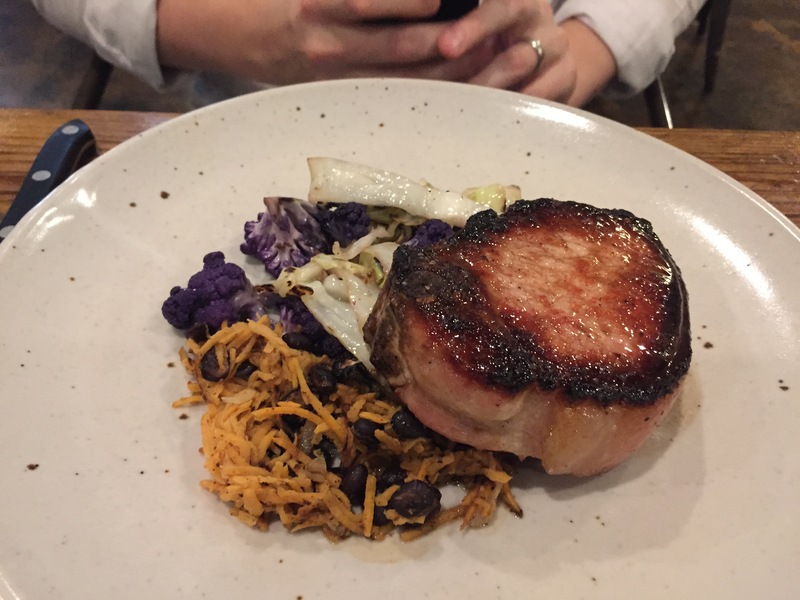 My husband’s entree: Center cut pork with a coffee butter glaze, and a sweet potato/black bean hash. So at this restaurant, they do whats called the “cut of the day”, where they feature a certain cut from their Mulefoot Pigs. This dish a great concept, but stacked against other restaurants that have the same “cut of the day” feature, this was mediocre by comparison. This is what your restaurant is known for, STEP IT UP! Michael Symon’s Roast at the Westin Book Cadillac in Detroit does a “beast” of the day, in which they select an animal and roast it all day; anything from lion to alligator meat. Mulefoot SPECIFICALLY does mulefoot hogs…..this is what your restaurant is named after, it should be the most extravagant item you prepare all day!!! This was not at all what we expected. The pork was tasty, tender, but rather lean. It had an interesting coffee taste that both my husband and I could appreciate, as it worked rather well with the taste of the pork. The sweet potato black bean hash was magnificent….but to me, it was overwhelmingly different. It had a completely different flavor profile that wasn’t cohesive with the pork. There was an interesting spice to it, something you might find in Latin food. The flavors were so contrasting that it didn’t allow the protein to shine, or the veggies to harmonize as they were meant to. 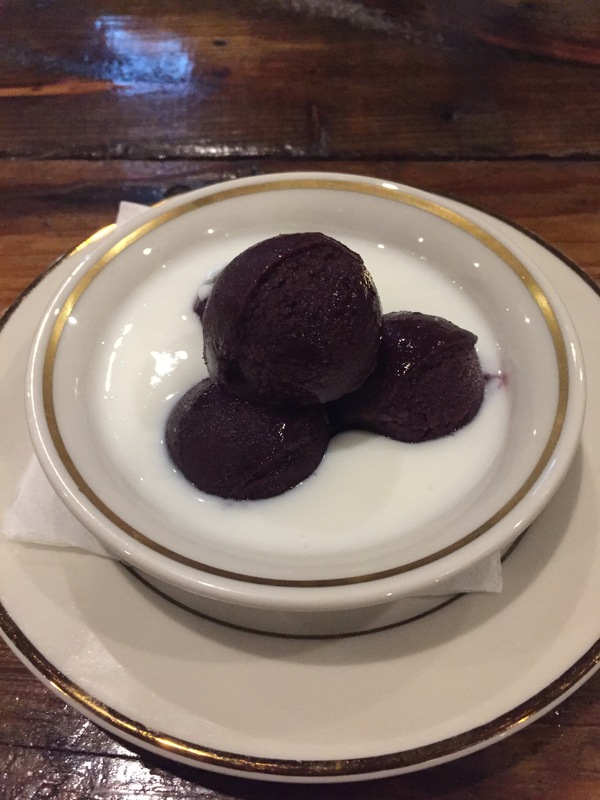 Dessert: Blueberry lavender sorbet with buttermilk. When the description mentioned buttermilk, I was not expecting the sorbet to be floating in it. Have you ever tasted buttermilk by itself? It is disgusting. It didn’t go with the sorbet AT ALL. WTF were they thinking!? What did they want to achieve with the buttermilk!? I rather enjoy the aroma of lavender, and even use lavender bar soap….but to my distaste, the lavender was overwhelming and too botanical to enjoy. This was my husband’s dessert. I didn’t get to taste it, and don’t actually remember what the whole dessert consisted of, but he said it was delicious. A little on the sweet side, but it was a nicely constructed dessert in his opinion. At this point, I was so underwhelmed by everything I had eaten that I couldn’t bare to be anymore disappointed. Maybe I should have tried it, and it would have changed my mind on the restaurant….but unfortunately, I was too far gone with my lack of desire to have a single bite of anything else. In summary, the restaurant itself was great; the staff was friendly and knowledgeable, and the food came out rather quickly. The food was decent, but the flavors were not developed enough, and the execution needs some tweaking. For this price point and type of cuisine, I’ve had better.